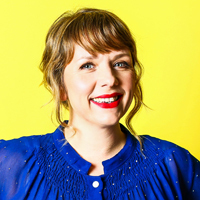 Kerry Godliman is a comedian and actor whose work ranges from her own radio sitcom to Live at the Apollo, from the National Theatre to BBC One’s Our Girl to Ricky Gervais’ Derek. As a standup, Kerry’s line in down-to-earth observations about life, family and laziness have been a hit on Live at the Apollo and on panel shows including Mock the Week and 8 Out of 10 Cats. She’s also appeared on Radio 4’s News Quiz, The Now Show and Just a Minute, and her own show, Kerry’s List. Kerry’s acting career started with brief appearances in the likes of Casualty and The Bill but grew to parts in Him and Her, Miranda, and Extras. She’s perhaps best known for her acclaimed portrayal of harassed care home manager Hannah in Ricky Gervais’ bittersweet sitcom Derek. Proving the breadth of her acting range she’s also starred in the Netflix comic film Mascots, the BBC military drama Our Girl, and on stage in the National Theatre’s exploration of immigration England People Very Nice.